Clubbing and modern culture go hand in hand. People from different age groups hit the pubs and nightclubs to freshen up and have a good time. And although you may argue that nightclubs get all their customers simply via word of mouth, that is not frankly the case in this digital era. Everyone is searching up things online. By having a website, and an established online presence, you can appeal to a whole new demographic of night owls, and bring more people to the party. Miami nightclub WordPress theme is created with nightclubs and discos in mind. With the theme, you will get three different homepage variations using sliders, static images, and video. All the pre-made design feature distinct color schemes capturing the thrilling and enticing side clubbers. All the designs are also responsive, meaning they will scale down perfectly when viewed from mobile devices. You get a default site layout which you can use to structure your entire website. And if you have issues, then Visual Composer drag and drop page builder is thrown into the mix to help you out with customization. The rich theme options panel is also riddled with an abundance of settings that let you control every single element in the theme. Other notable features include the option to set up a slideshow, create a section to showcase testimonials, a contact form, and Call to Actions. Google Maps integration is also there allowing you to show users exactly where your club/pub is located. 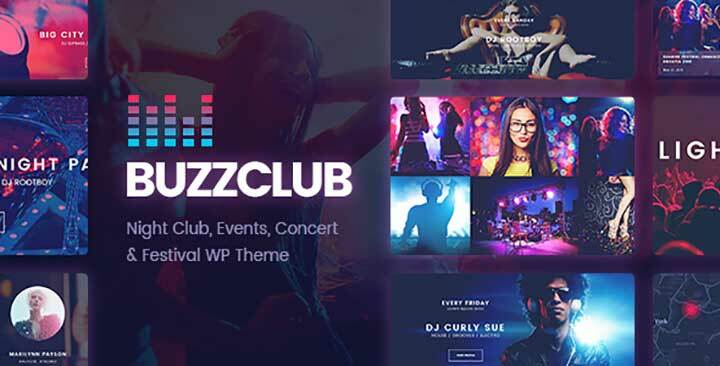 Buzz nightclub WordPress theme is targeted at music and nightclubs where DJs and Bands come to perform. It is also suited for websites about any music festivals and concerts. Not only does it look cool embracing the lively essence of nightlife in its aesthetics, but it also carries home many of the functionalities required by such music gigs. For starters, the theme throws in an event plugin which lets you coordinate and schedule all upcoming events and shows. The dedicated Instagram plugin allows you to easily share updates in Social Media so that you always keep people in the loop about everything that’s new. Besides this, you get a handful of portfolio styles to show off all the previous performances that happened at your place. And blogging support is also included in case you find it necessary. There are also plenty of design options as well. For starters, you get access to nearly a hundred shortcodes. All this will help you easily insert different elements around your website. On top of that, you get access to two premium plugins – Revolution Slider, and Layer Slider, for integrating sliders into your site. For customization purposes, you get access to unlimited color schemes, and there is also the option to upload a custom background image. 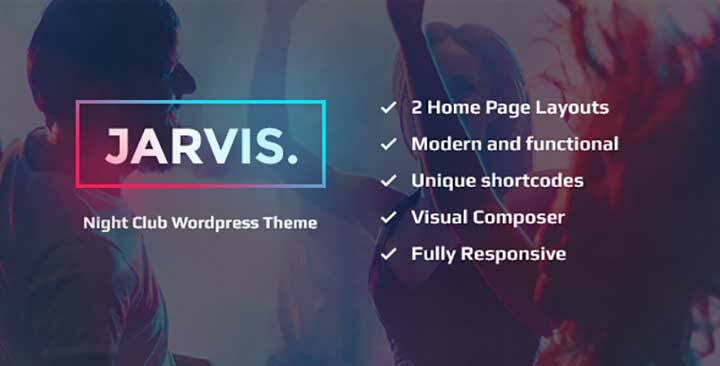 Jarvis WordPress nightclub theme can help you create stunning websites for Night Clubs, Concerts, and Festivals. It boasts a modern festive design with a lot of blacks complimented by neon color schemes. You will find the design suitable for lounge bars, and other types of party websites as well. In fact, with a little creativity, DJs and musicians can also it for creating their online presence. Some of the key features of the theme include an integrated online table & ticket booking system along with WooCommerce so that payments can be accepted through the website. A built-in booking calendar which allows users to see all the upcoming gigs. There is also an advanced program & events management system for added ease. You can show off all your previous performances using the beautiful gallery. Apart from these, there are plenty of other notable features worth mentioning as well. For starters, you are handed two different homepage layouts. You can tweak them using the immense collection of customization options. WP Bakery is provided to help you fine tune the layout. Revolution Slider is also provided to help you integrate sliders into your site. Event WordPress theme is developed for music, events, and entertainment sites. To help you create a stunning layout, the theme comes with the Themify Builder with drag and drop options. But you won’t have to start from scratch as the theme also features different pre-made layouts and demo sites as well. With this night event WordPress theme, you will get access to three different custom post types for Events, Galleries, and Video posts. Using the event post type, you can keep readers informed about your upcoming events and gigs. The Gallery post types can help you highlight all your previous performances. And you can use the Video Post type to show some of the featured moments in all the previous performances as a teaser. 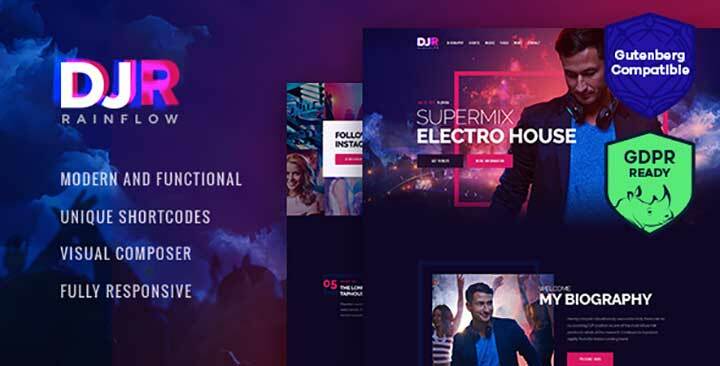 DJ Rainflow WordPress nightclub theme features a modern and functional design with a lot of dark and neon colors. DJs, bands, singers, and similar musical artists should find the theme to be extremely useful. It comes packed with three homepage layout out of the box which you can use to base your site’s design. All of these are customizable and can be tweaked using the Visual Composer drag and drop page builder that comes pre-installed. The theme admin interface is loaded with a bunch of options and settings as well. You can use this to tweak different design elements further. Shortcode support is also provided so you can easily apply any design changes to any part of your website. Besides this you also get access to Revolution Slider to add sliders to your site and Essential Grid for further customization of the layout. Now all the features of the theme aren’t geared toward customization alone. There are many tools that can help you with event management as well. WooCommerce compatibility allows you to set up an online store so you can sell merchandise as well. Some other notable features include Contact Form 7 integration, MailChimp Support, and Google Maps. CitySoul is a music and nightclub WordPress theme suited for entertainment based websites and also for nightclubs. It carries a much more refined and elegant design style which will appeal to a target demographic filled with older, more mature people. From the get-go, you get access to 4 homepage style layouts along with five homepage styles – Jazz, Rock, Broadway, Electronic, and yes, even pool party. 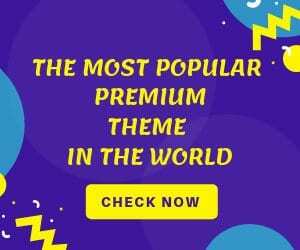 This nightclub WordPress theme can help you show a routine or a schedule of when all your next events are coming up using any of the four calendars bundled in. You can even showcase your events using different layout styles. Of course, all these can be customized using Visual Composer which comes preinstalled. Besides the drag and drop page builder, you get access to other premium plugins like Master Slider for creating sliders, WooCommerce for setting up an online store and even Contact Form 7 to connect with your readers. Other notable features of the plugin include social media integration, membership login area, a gallery to showcase images and videos, dedicated newsletter, and Google Map integration. The Apollo WordPress nightlife theme features a vibrant and colorful design similar to contemporary festive websites. Nightclubs, bars, concerts, and music festivals will find the aesthetics of the theme quite appealing. The demo content can be easily imported with a single click. You can then tweak some of the design using Visual Composer, or the plethora of customization options. Coming to the feature side of things, the theme comes with its booking and appoints management system. You can provide all the information on the upcoming events using the Events Calendar plugin. To clear customer queries, and to help them get in touch with you, there are dedicated Contact & Booking forms as well. WooCommerce compatibility allows you to set up an online store where you can sell CD’s, mixes, and merchandise. 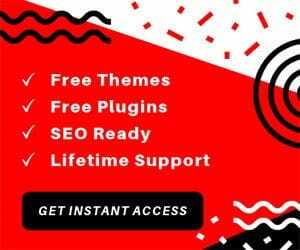 Other notable features of the theme include shortcode support, an option-rich admin interface, sticky menus, customizable Google Maps, Parallax Background, and so on. 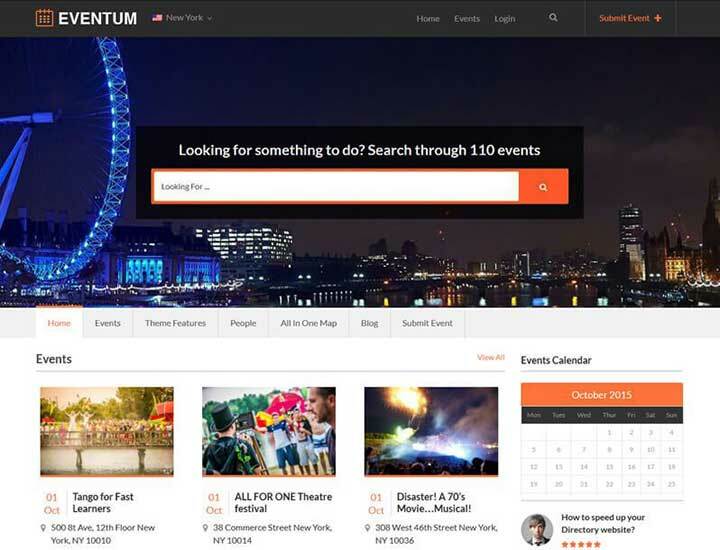 Eventum WordPress theme isn’t necessary for an event/entertainment website but dedicated to helping build online event directories. Out of the box you get access to plenty of pre-made demo pages to quickly develop your events directory along with a dedicated event calendar to showcase when each event is scheduled. 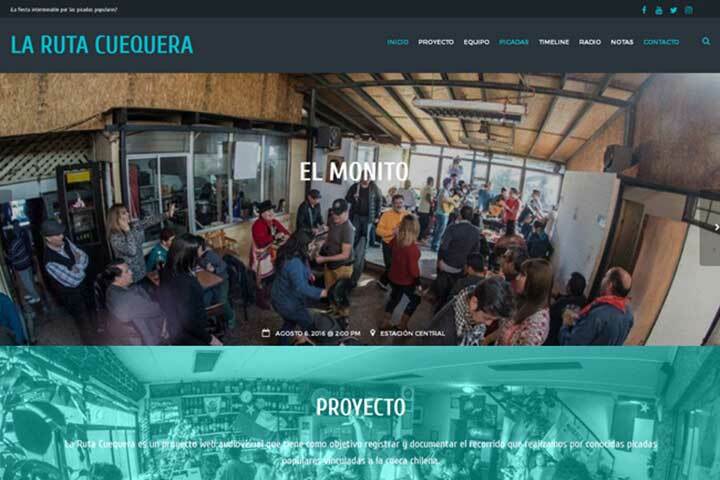 Some notable features of the theme include an option to set regular or recurring events on your site for events that take place on a routine basis. For the added convenience of your users, you can categories the events into current, upcoming, and past. There is even an option to set reminders to calendars for when an event is about to happen. And if a user is interested, they can purchase tickets to your event directly from your site. You can also keep track of all the events attendees. 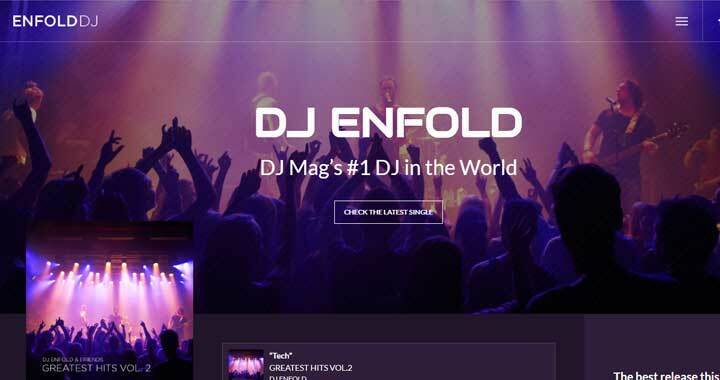 Enfold is one of the easiest to use Multi-purpose WordPress night club theme on the market. It is filled with an abundant collection of pre-made websites for different use cases, including some for nightlife websites. This is the perfect theme for webmasters who are focused on how their site looks and feels, and are willing to do a lot of customization to achieve perfection. The core feature of this nightclub WP template would be its custom drag and drop editor with which you can easily create a mockup of your site’s layout in the back-end. To add on that, there is the powerful Admin Area which is riddled with features for further tweaking different design elements of your website. Besides all this, you will also get a sidebar manager, Shortcode editor, and an integrated Form builder powered by Gravity Forms. And yes, WooCommerce support is also provided. BeTheme is yet another multipurpose WordPress theme for night life which features over 390 pre-built websites. There is something for every single niche website you can image, and that too with multiple variations. The entire plugin is powered by the powerful Muffin Builder 3 which comes with a lot of design elements and modules for building your website. To help with customization even further, the theme throws in different header variations, and side slide menus as well. But despite all these extra elements, the theme is super light at only 6 MB. This makes it load superfast. 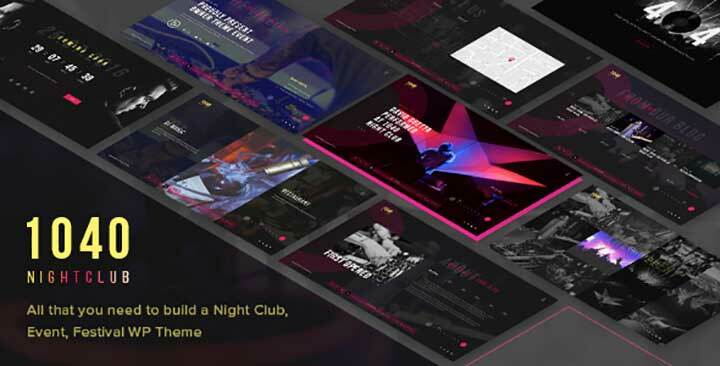 All in all, pick BeTheme to build your nightlife website if you are looking to create something unique, and like to spend hours on customization and fine-tuning. TheGem is a high-performance multipurpose WordPress nightclub template designed for creative individuals. This club theme packs in over 200 creative templates and 70 creative concepts out of which plenty appeal to the music artist demographic. You will also find a few templates suited for events and festivals as well. And to add on that, the Visual Composer integration provides allows for easy customization of all the pre-made web pages. There are plenty of design elements and modules which you can use to enrich your site’s appeal. For example, you will get access to plenty of fancy page headings, video and parallax sections, mega menus in two different styles, one-page scroller, and over 2500 customizable icons. Widget and shortcode support is also provided to add extra features to your site. And if that’s not all, Slider Revolution and Master Slider will help you add feature-rich sliders into your site. WooCommerce support is also provided to help you create a complete e-commerce experience. 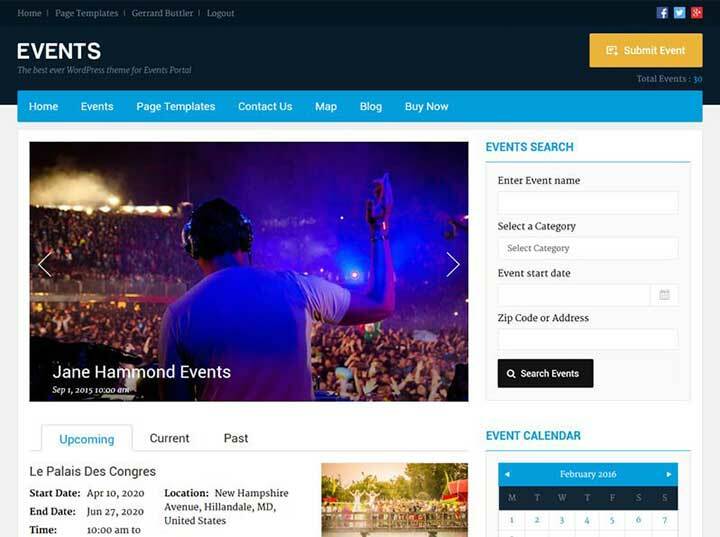 Events is another flexible event directory WordPress night event theme filled with tons of customization options and loads of useful options. The homepage itself is loads to a ton of widgets to showcase upcoming and current events, an event calendar, an advanced search functionality, and even a review & rating section created by other site visitors. Some of the key features of the plugin include the option to quickly create recurring events. There is also the provision to showcase user event submissions to make your site into a user-driven events portal. Google maps integration makes it super simple to find out where each event is taking place. Users can fill out a simple submission form to buy tickets from any event they are interested in directly from the site. There is also the option to provide discount coupons to attract even more users. 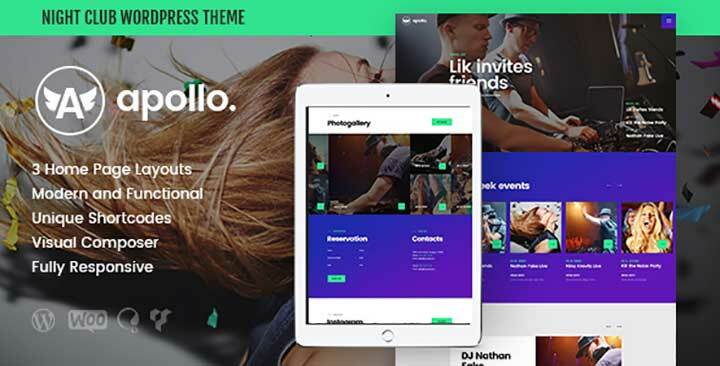 Kallyas is another one of the popular creative multipurpose WordPress club themes with a focus on e-commerce. This makes it an ideal choice for DJs, and Bands who want to sell tickets to their shows, or allow fans to purchase their albums and CD mixes online. You will get access to nearly 60 customizable premade demo sites to help you create your website. The theme grants you access to the powerful Visual Builder functionality along with 100+ elements to create featureful site layouts. Revolution Slider is also there to help you create sliders. Other than this, you get access to bbPress and BuddyPress plugin which can help you create a forum, and community experience directly into your website – something your fans will surely enjoy. 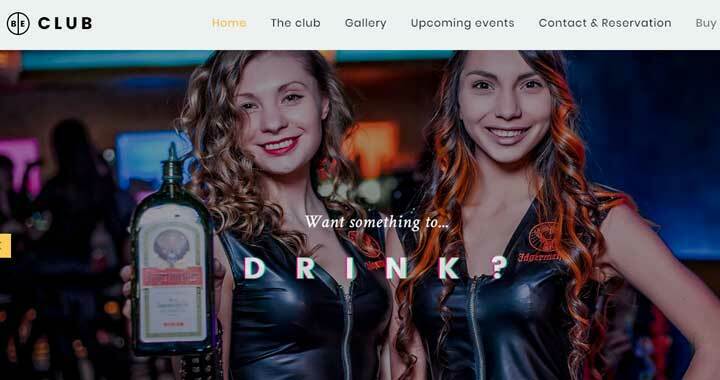 1040 Night Club is a simple WordPress nightclub theme targeted towards Night Club owners to help them create an appealing website. The website’s performance is rapid and snappy as it is built on top of the powerful BootStrap 3 framework. For added customization, you can leverage its rich collection of options and settings. VC page builder is also added into the mix as well. Besides looks and design, other notable features of the plugin include the Event Calendar plugin which helps you to showcase all upcoming gigs. Contact Form 7 integration allows your readers to get in touch with you about booking, or similar queries. You can also keep users informed using the fullscreen video on the home page, a dedicated service page to show what your pub has to offer, a gallery page with lightbox effect for viewing all previous performances, and yes a dedicated blog page as well. FWRD WordPress nightclub theme has been purely created for Music Bands and Musicians in mind. It packs in 6 different ready to use demo pages, including a coming soon page. As you have seen with the other themes, Visual Composer is also provided with this one to help you customize the layout. A dedicated menu builder is provided as well to help you create easily navigable menus for better user experience. However, the main feature highlight of the theme is that you can use it in a one-page layout. You also access Hot Links which allows you to provide links inside your site to help readers jump from one section to another. Other notable features include an Events & Gigs manager, inbuilt Audio Player, WooCommerce compatibility to run an e-store, and a dedicated events & gigs management system. Bridge multipurpose WordPress theme boasts over 376 websites and 24 layout concepts curated for creative individuals and agencies in mind. 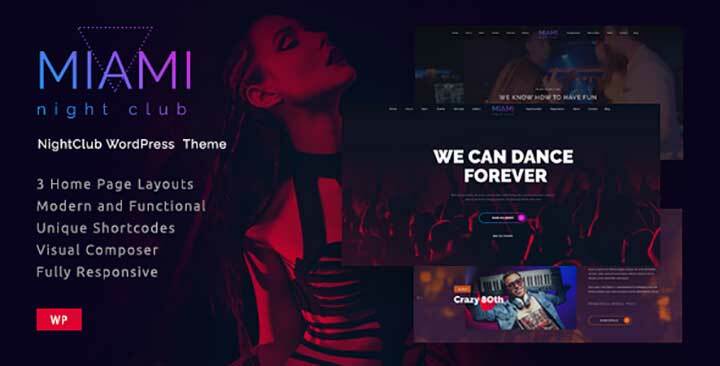 It is one of the most budget-friendly nightclub WordPress themes in the market featuring such a vast collection of pre-made content at your disposal. Visual Composer, Slider Revolution, and Layer Slider plugins are also present to help you with customization and adding sliders to your site’s layout. Apart from this, you get social media integration; Ajax powered transition effects, CSS3 animations, and stunning infographic elements. There is also an advanced search functionality to help users easily find out the content they are looking for. WooCommerce compatibility is also provided to help you create an e-store experience. 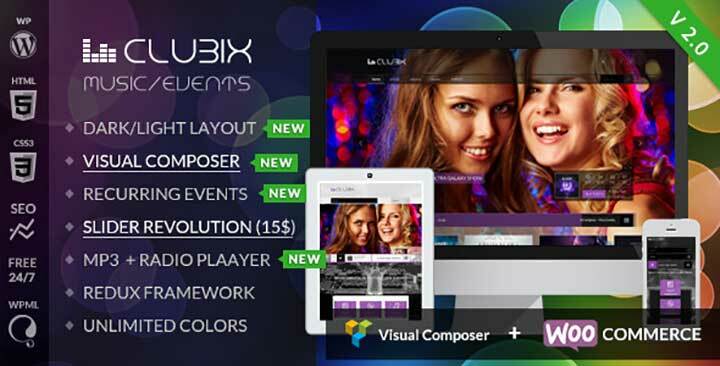 If your band, nightclub, or music magazine needs a website which looks professional but is easy to use, then Clubix WordPress theme might offer the perfect solution. It packs a strong, vibrant, and colorful design – the sorts we expect for similar businesses. But avoids with heavy customization options which can get overwhelming for beginners. It, however, delivers are all the niche-specific features to properly run your site. To begin with, you get shortcode and widget support for integrating an MP3 player or Radio onto your website. Visual Composer drag and drop page builder is there to help you fine-tune the design. Revolution Slider is also there to enable sliders on your site. Recurring Events plugin will help you better manage – recurring events. You will also get a dedicated page and post types for the artists featuring at your joint. And if all this is not enough, WooCommerce support is also provided to help you create your nightlife shop. 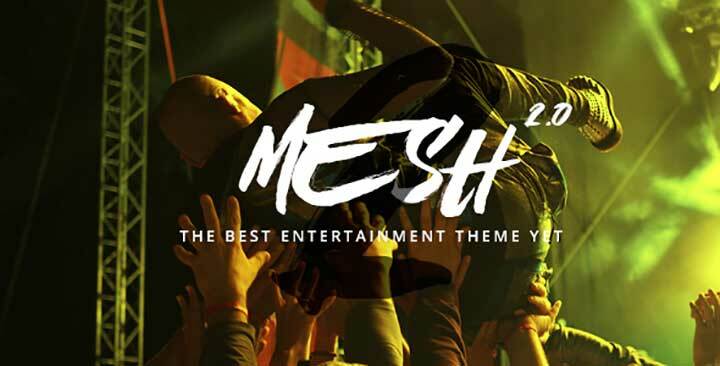 MESH nightclub WordPress theme “meshed” together all the key elements of what makes a rich entertainment website and put it into a single package. You get access to six demos websites which can be used for creating sites for festivals, Radio, music artists, album releases, and of course – clubbing. The main feature highlight of the theme is its easy booking functionality with Tickera which can help your audience buy tickets or service tables at a party. This nightclub WordPress theme also features a built-in music player. Your users can listen to your music playing in the background as they go on browsing your website. Social Media integration is also provided which helps people coming to your site share upcoming events with their friends on social networks. You will also get access to Visual Composer to address all your customization needs. Revolution slider will help you add sliders to your site. You will also get six menu layouts, along with photo galleries, Ajax transitions, and two blog layouts. Any Other Nightlife WordPress Theme? So these were our picks for the best Nightlife WordPress themes. We hope you found this to be helpful. Also, if you have used any of the themes mentioned here on the list, then don’t forget to write about your experience in the comments section. Your fellow readers will find your insight quite helpful while selecting the perfect theme for their requirements.